4WD, ABS brakes, Auto-dimming Rear-View mirror, Compass, Driver door bin, Driver vanity mirror, Electronic Stability Control, Entertainment system, Front dual zone A/C, Front reading lights, Garage door transmitter: HomeLink, Heated door mirrors, Heated Front Bucket Seats, Heated front seats, Heated steering wheel, Illuminated entry, Low tire pressure warning, Navigation System, Outside temperature display, Overhead console, Passenger vanity mirror, Power moonroof, Rear reading lights, Rear seat center armrest, Remote keyless entry, Tachometer, Tilt steering wheel, Traction control, and Trip computer. Are you still driving around that old thing? 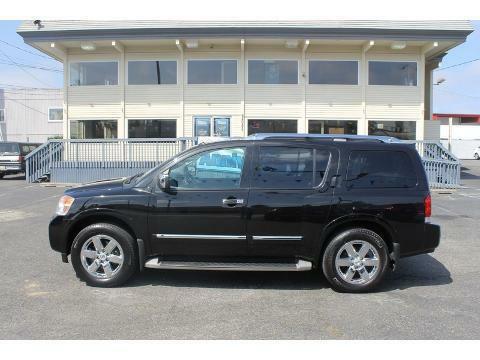 Come on down today and get into this superb-looking 2011 Nissan Armada! The plentiful amounts of interior space of this fantastic Armada will make it a favorite among our more educated buyers.